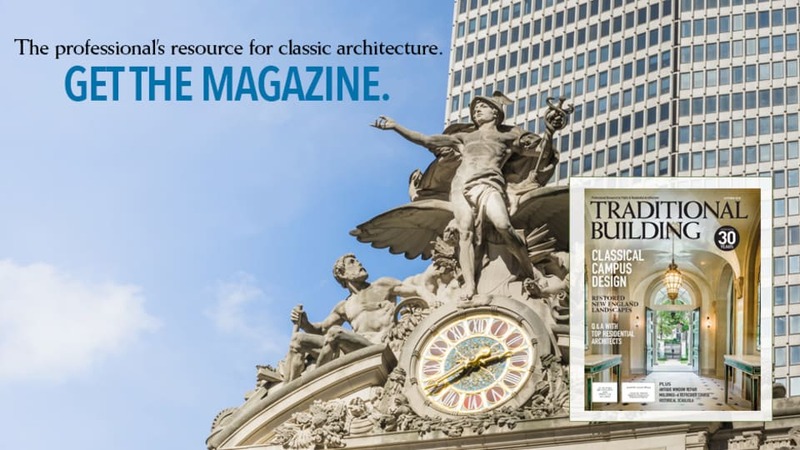 What does it take to return a 200-year-old landmark of timeless classical design, and by some legendary architects, to its original concepts for today’s needs? A recent project by John G. Waite Associates, Architects, PLLC, of Albany and New York City sheds light on some creative answers. 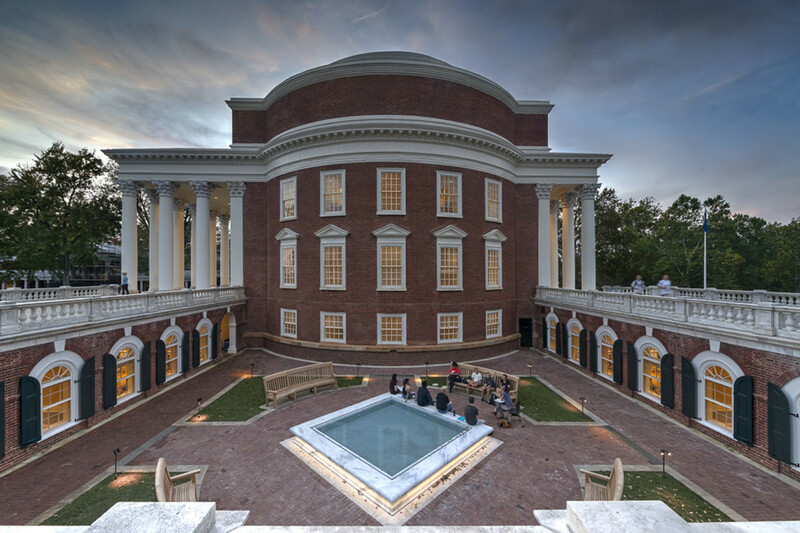 Completed in 1828, the brick-and-marble Rotunda at the University of Virginia is one of the masterworks of Thomas Jefferson as architect, and designed to be the centerpiece of his Academical Village. 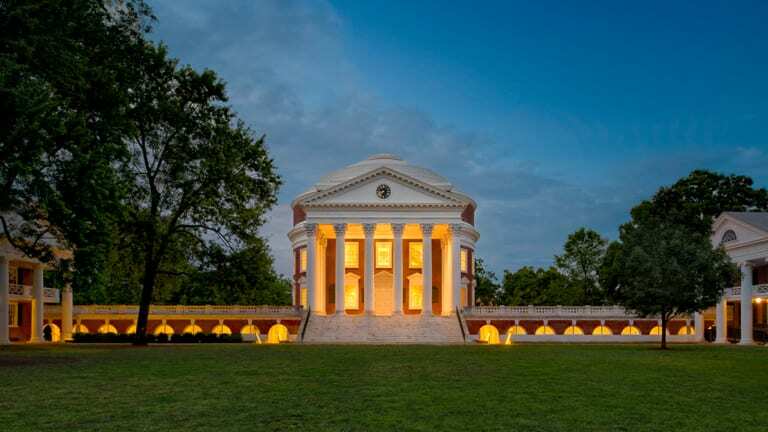 A domed cylinder 77 ft. high and equally wide inspired by the Pantheon in Rome, it is renowned as a paragon of Palladian architecture and, along with Jefferson’s home Monticello, is one of only three cultural UNESCO World Heritage Sites in the United States. 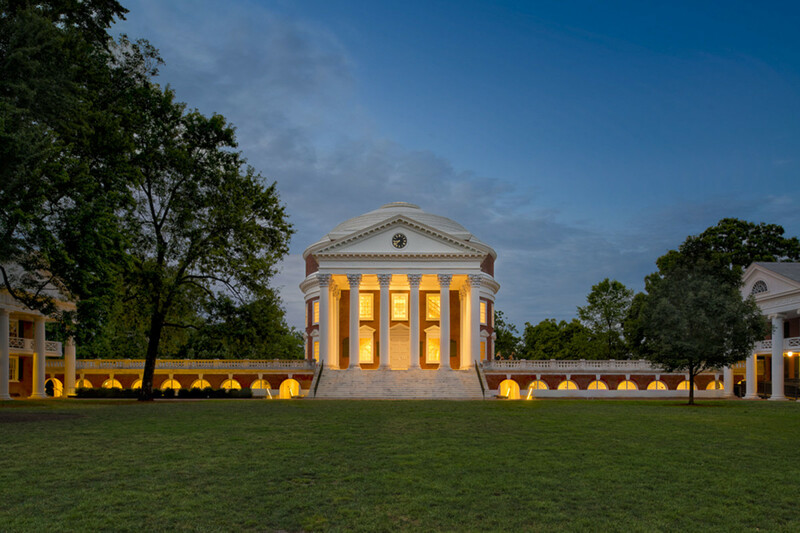 Nonetheless, the Rotunda has seen repeating rounds of physical changes, devastating trauma, and even lost purpose that cycled into the 21st century. Temporary steel shoring was erected to support the portico roof structure during the removal and replacement of the marble column capitals. 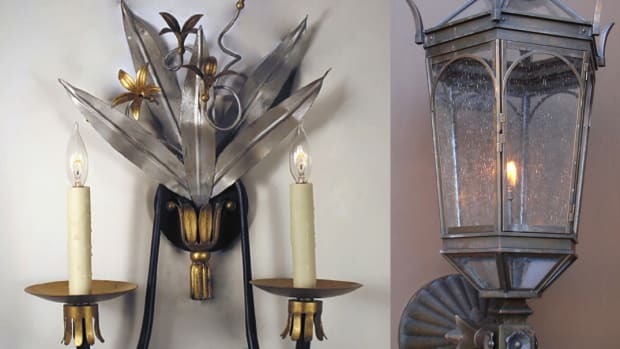 The copper sheet metal cornice installed by Stanford White following the disastrous 1895 fire, was removed, stripped of paint, refinished and reinstalled on restored cast-iron framing brackets. The existing north marble stair was dismantled, cleaned, repaired and re-installed above a new waterproof membrane protecting the building construction below. The stairways at the ground floor and first floor levels were restored to their historic appearance. The basement staircases were rebuilt and enclosed beneath the principal first floor stairs. 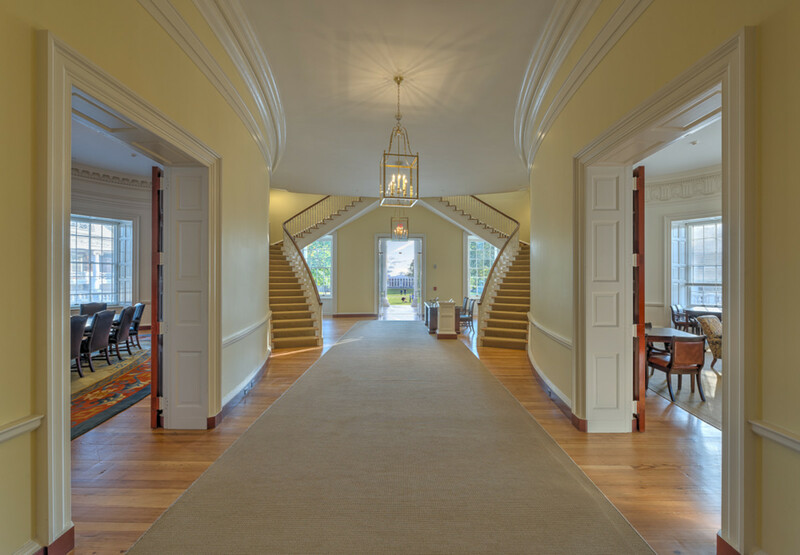 The reconfiguration of the reconstructed stairs allows access to the windows facing the Lawn. Understanding the building’s history was indeed the challenge. In 1895, the Rotunda suffered a tremendous fire that not only destroyed an 1854 annex designed by Robert Mills, but completely gutted the Rotunda’s interior and wood-frame dome, leaving only the brick outer walls of the main drum. Shortly thereafter, the University commissioned McKim, Mead & White—specifically Stanford White—to restore the building. 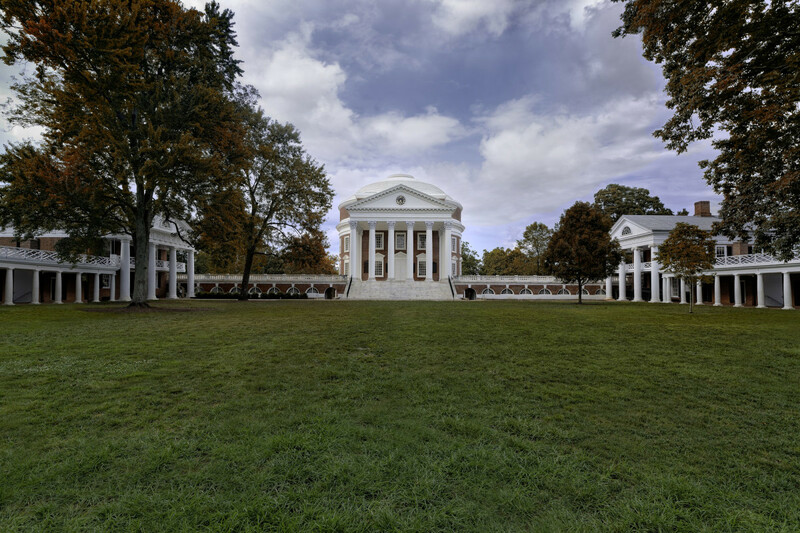 Jefferson designed the Rotunda’s upper floor as a library, but since it had outgrown that space, White redesigned the building to be mostly library. As originally constructed, the Lower East Oval Room was located at ground level, bearing on red clay soil. The brick walls were underpinned and the space beneath the room was excavated to provide new mechanical and service space. 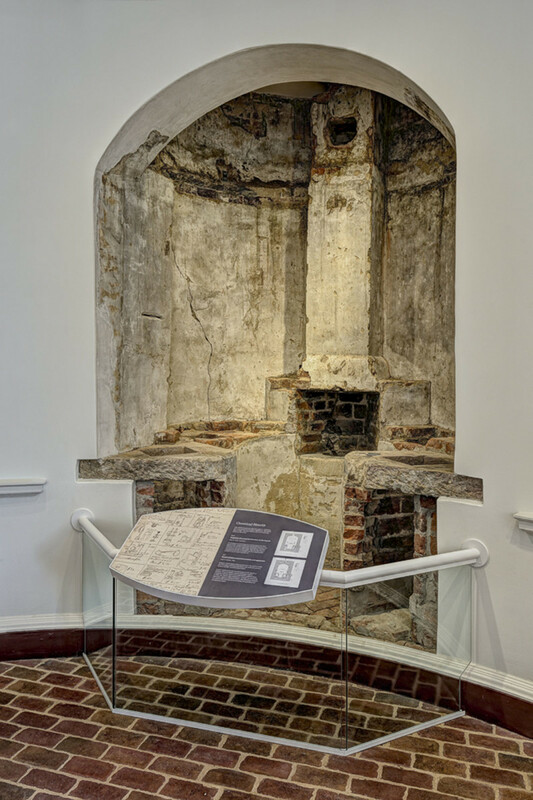 Archaeology conducted beneath the 1970s brick-paved flooring confirmed the existence of brick footings for two structural columns, located on the longitudinal axis of the room. These columns would have originally supported the floor structure of the Upper East Oval Room, located at the main floor level. At the north end of the space temporary construction has been installed to protect the newly discovered Chemical Hearth dating from 1825. As Clay S. Palazzo, AIA, LEED AP, explains, “White brought in the R. Guastavino Company of New York City and reconstructed Jefferson’s dome and the roof of the south portico using Guastavino tile vaulting,” a unique clay-tile-in-mortar system stronger than comparable concrete and more fire resistant than concrete or steel. White then added the north Portico—also with Guastavino vaults—and replaced all of the window architraves and pediments over the windows, which had been wood in Jefferson’s design, with sheet copper painted white. New north terraces that run across the north side (University Avenue side) of the building are also White’s, and he interconnected the north and south terraces with colonnades. Then, in the mid-1970s with the U.S. Bicentennial looming, the University decided to gut and redo the interior yet again. “The intention was to remove Stanford White’s design elements and put back what they thought Jefferson had done,” says Waite, noting that the project was without adequate research or financial resources. 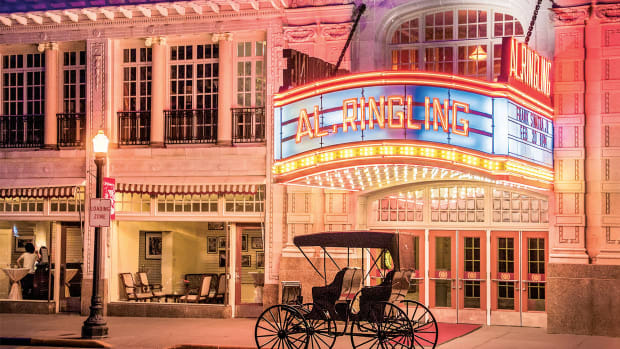 To determine the historic fabric still evident from these various periods, and its significance, the architects turned to extensive physical and archival research as part of an exhaustive historic structures report. The east courtyard was excavated to provide a new subterranean vault that is used to separate mechanical equipment and service areas from the historic spaces. The east walls of the Rotunda were underpinned, and the new basement was extended beneath the building. Temporary shoring was constructed at the north and south porticos to facilitate the replacement of the marble column capitals. Contextually designed courtyards were constructed to the east and west of the Rotunda in the spaces enclosed by the terrace wings and connecting colonnades. Olin designed a new fountain for the east courtyard, shown here. The terrace wings were renovated and restored to house offices and classrooms. New mechanical and service areas are located beneath the east courtyard. Perhaps the longest-missing casualties of the fire were the marble Corinthian capitals that once topped the portico columns. 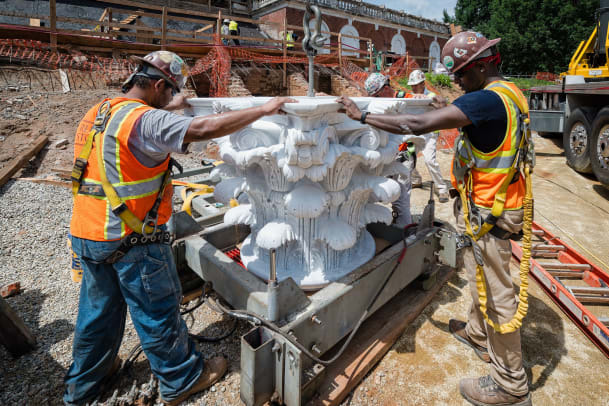 “Stanford White took down the damaged capitals and put up uncarved blocks of what we believe was Vermont marble, but probably in a pretty poor grade,” says Palazzo. “Due to financial shortcomings, the University didn’t actually carve those capitals until almost five years after Stanford White left the job (perhaps to save his fee), and when they did, they were carved in place.” Plus, adds Waite, it was under the direction of a visiting sculptor at the University. 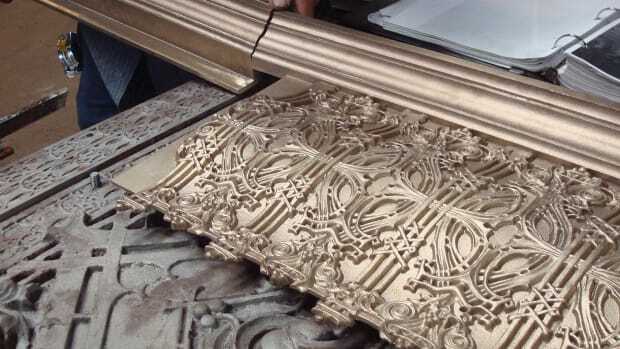 To authentically recreate the Jefferson capitals, the architects started with surviving fragments of originals. “We laser-scanned about a one-third fragment located near the University’s art museum,” says Palazzo, “then replicated the piece using a CNC machine followed by hand-carving.” Different fragments supplied other information for missing parts, along with clay modeling based upon very sharp photographs made from glass-plate negative of the Jefferson capitals taken prior to the 1895 fire. 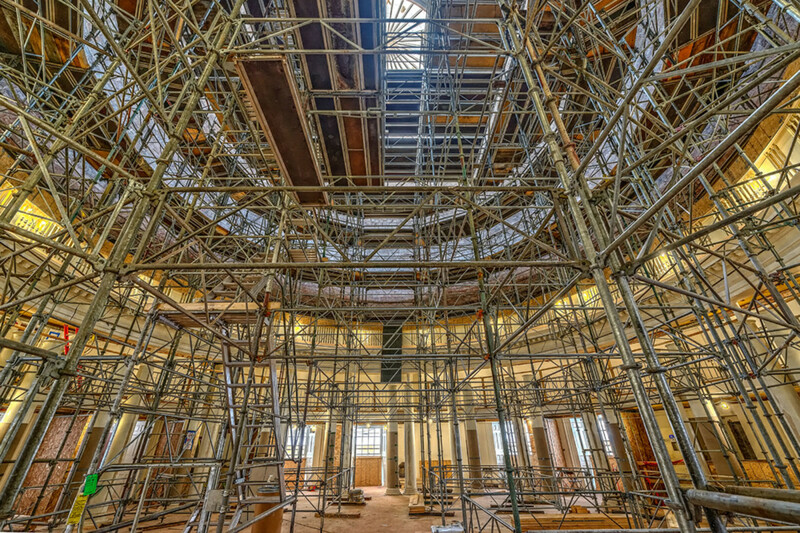 The dome room under construction. Seismic stability also became mandatory. “It turned out, that there was actually no positive engagement between the portico, the column capitals, and the column shafts,” explains Palazzo. 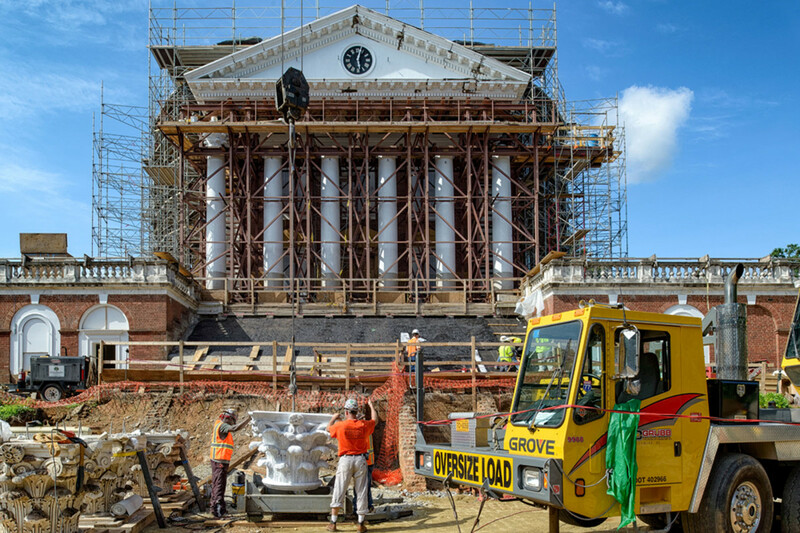 “The capitals were just sitting on the column shafts held in place by gravity,” he says, “so we designed a system to pin the portico structure to the capitals, and the capitals to the shafts.” They also introduced new stainless-steel ties to anchor the porticos back to the brick drum of the Rotunda. 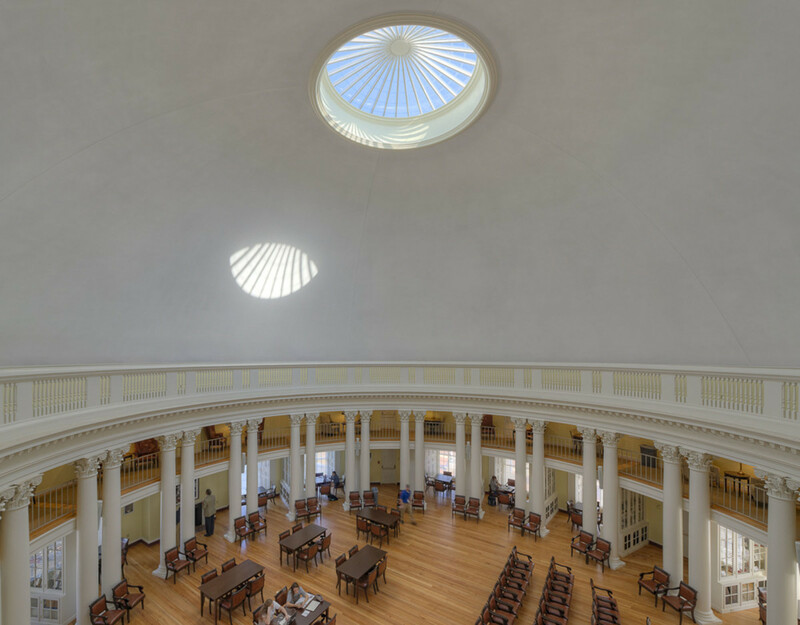 The restored dome room is used as a library and study, and can accommodate up to 200 people for lectures, receptions and dinners. Inside the Rotunda, the lost and missing included not only Jefferson’s original interior but most of Stanford White’s version as well, so the project became a matter of renovating and modifying the 1970s reconstruction to better represent Jefferson’s 1823 designs. “In the dome room, we replaced the 1970s perforated aluminum ceiling panels with acoustical plaster,” say Palazzo, “so we actually went back to Jefferson’s idea of a full plaster ceiling.” They also improved the intermediate gallery in the dome room, making it accessible to students and the public with new stairs, while replacing the cast plaster capitals along the gallery columns with hand-carved wood replicas of the originals. Also replaced was the skylight in the dome room, using insulated glass panels that produce the same visual appearance of the single lapped, glass pane glass in the original oculus. The solution to the problem was recognizing that the stairs to the basement needed to be lesser in stature than the main stairs going up. 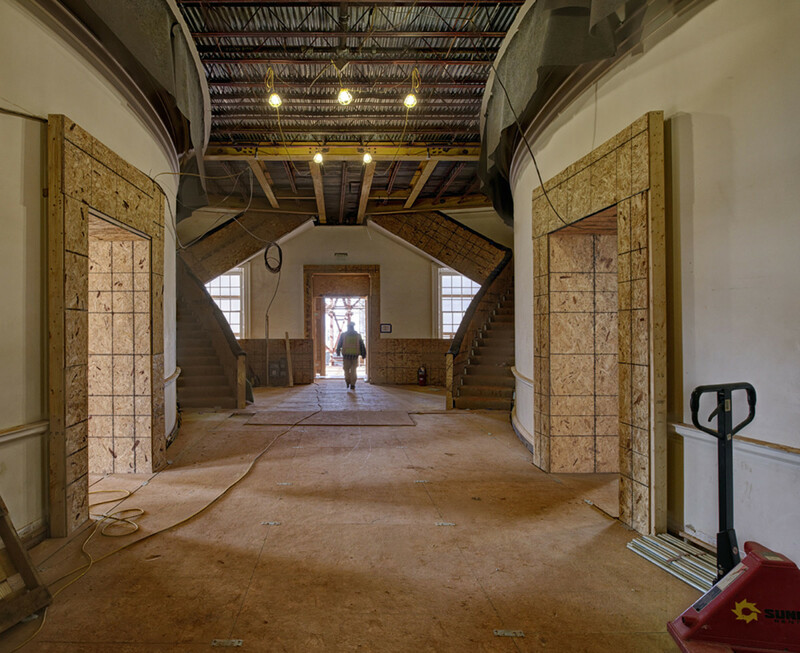 “So we tucked the basement stairs under the main stairs, re-establishing the visitors’ ability to stand in the lobby and walk up to the south windows,” explains Palazzo. An underground vault was an idea the architects had proposed from the very outset. “In early stages, it was to be a new sub-basement under the Rotunda,” says Palazzo, “which would have required underpinning the entire structure.” That transformed into vaults under both the east and west courtyards, which wound up most feasible as under only the east courtyard. 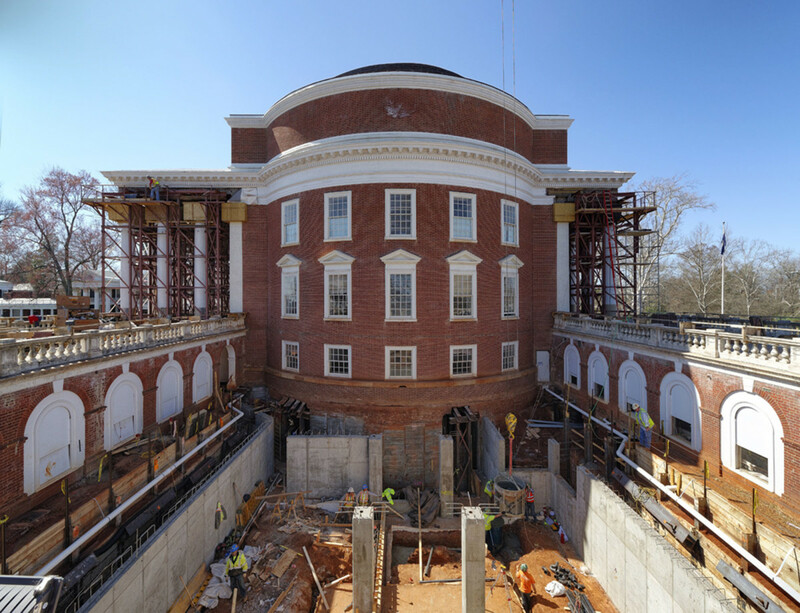 This service level actually takes up the entire footprint of the east courtyard by underpinning the adjacent terraces, as well as the east side of the Rotunda. 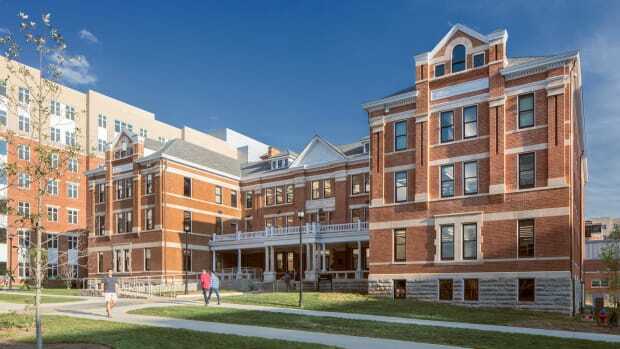 “We were able to create a new service entry that’s separated from, and to the east of the Rotunda complex and interconnects via a corridor with a new service elevator and a new service stair within the drum of the Rotunda.” There’s space for mechanical equipment and duct distribution, plus a pump room for the east courtyard fountain, and machine rooms for the two elevators. Speaking of service, the dome room of the Rotunda hosts approximately 200 dinners a year, so the architects also designed a catering service kitchen as part of the underground vault. Sums up Waite, “I think a lot of what we did is unseen—and that’s intentional.” It’s an approach that, in many ways, has served to bring the Rotunda full circle. 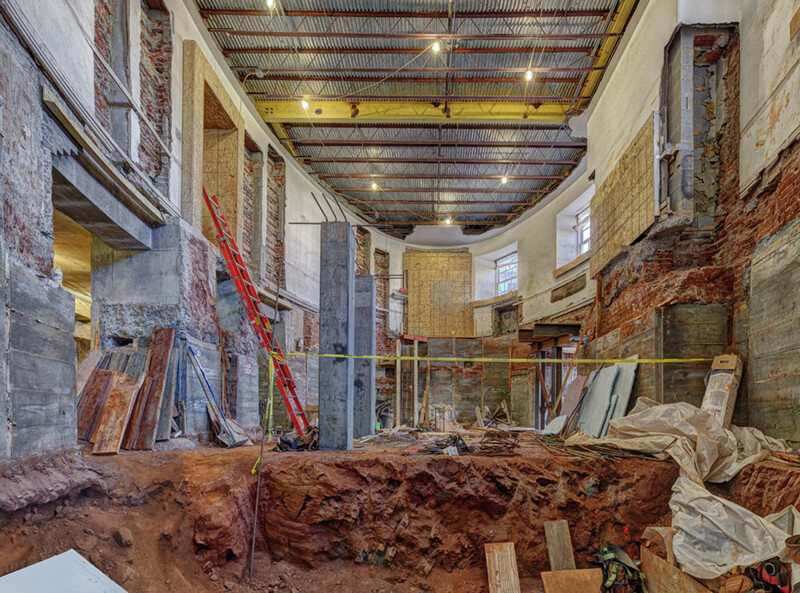 While preparing for the recent renovation, the architects discovered a void where two of the three oval rooms come together. “What was entombed there is what’s called a chemical hearth,” explains Waite. Turns out, the hearth is an amazing sole survivor. In 1825, Thomas Jefferson brought in Dr. John Patten Emmet as the first professor of Natural History at the University, and for the express purpose of teaching chemistry. 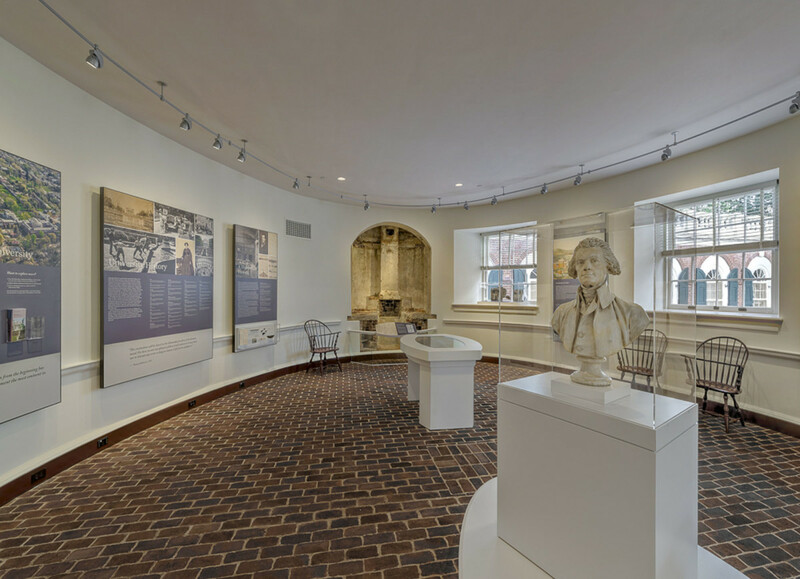 The Lower East Oval Room, situated above newly constructed mechanical space, houses museum exhibit space that highlights the preserved Chemical Hearth dating from 1825.